Necker Island, Sir Richard Branson's private paradise, is situated in the British Virgin Islands, a stunning and unspoilt area of the Caribbean. Book the island privately for up to 34 guests, or enjoy the Necker Island experience 'house party style' during Celebration Weeks, when individual rooms can be booked by singles or couples. Blending into the tropical landscape are eight beautiful Balinese Houses providing guests with stunning ocean views and privacy. Right in the centre of the island is Temple House, a suite with infinity pool, separate lounge and kitchen and the private Love Temple, each sleeping two adults. Further accommodation is available in The Great House, a spacious al fresco style Balinese villa which boasts amazing panoramic views of the Caribbean, the Atlantic and neighboring islands. All rooms and suites at Necker Island feature luxury toiletries from Aromatherapy Associates and all are air conditioned. Accommodation on Necker Island includes nine bedrooms in the Great House and six individual Bali Houses dotted around the island. There is also a bunk-room in the Great House that sleeps up to six children. Situated right in the middle of the island with panoramic views, Temple House and the Love Temple are built in the same Balinese style. All rooms have private en-suite bathrooms. We have 17 rooms as well as a bunk room that accommodates six children. This spacious al fresco style Balinese villa boasts amazing panoramic views of the Caribbean, the Atlantic and neighboring islands. Each of the eight guest rooms has a balcony, and all come with king-size beds and en-suite bathrooms. On the upper level you'll find the Master Suite, complete with private outdoor Jacuzzi and outdoor bath. All rooms have king size beds which can be split into twin beds in most cases. All rooms in the Great House are fully air-conditioned. The Great House is the place where people come together, and has an expansive outdoor terrace with hammocks and sofas. There's a state-of-the art kitchen where our resident chefs prepare their famous dishes and multiple dining areas for everyone to gather round to enjoy their meal. There is also a fully-stocked bar where our team can make you your favorite cocktails, or you can just help yourself! For a bit of fun, there's also a snooker table, piano, lots of comfortable sofas and cushions, an entertainment system and guest computers with internet access. Upon the roof, you'll find a cozy two-person Jacuzzi - perfect for sipping champagne as you watch the sunset. Almost on the edge of the island you will find Bali Beach, Bali Hi, and Bali Cliff on the cliff edge. Each can accommodate one couple. They each have private terraces and all have access to a shared plunge pool with striking views of the ocean. A beautiful double room all on one level with private entrance and terrace complete with a relaxing daybed. And, it's only two steps away from the plunge pool. Bali Beach can be split into twin beds. Bali Hi is a three-tiered Balinese house. The ground floor lounge leads on to the bedroom on the middle level, and on the top floor is a cushioned relaxation area with spectacular views along Turtle Beach. Bali Cliff has to be one of the most romantic settings you're ever likely to experience. Bali Cliff perches on the edge of the island facing out to sea and has a double bedroom and open air bathroom to maximize the views and sounds of the ocean. Situated in the middle of the island in complete privacy and seclusion you'll find Bali Lo, Bali Buah and Bali Kukila, each accommodating one couple. Guests staying in these houses share a beautiful freshwater swimming pool, and a small stream runs between Bali Lo and Bali Buah. Bali Lo is a three-tiered Balinese house. The ground floor lounge leads on to the bedroom on the middle level and on the top floor is a cushioned relaxation area with spectacular views out to the ocean. Bali Buah, the Indonesian name for fruit, is built adjacent to Bali Lo. This spacious double room has an en-suite bathroom below and a large balcony with chairs and a hammock affording fantastic views of the fruit trees and the ocean. Bali Buah can also be split into twin beds. Bali Kukila takes its name from the Indonesian word for bird. This spacious room has uninterrupted views out to the sea and a spectacular terrace. A minimum stay may be required and supplements will apply for Christmas, New Year, Thanksgiving and Easter. Please inquire for more information regarding rates. Please note: spa treatment is not included in the rental rate. Exclusive hire of Necker Island from 1st January 2019 to 19th December 2019 includes use of the Great House with 11 bedrooms inclusive of the Master Suite as well as Leha Lo, Bali Lo, Bali Buah and Bali Kukila sleeping a total of 30 guests. Exclusive hire of Necker Island from 20th December 2019 - 31st March 2020 includes the use of 17 bedrooms; made up of 11 in the Great House, inclusive of the Master Suite, as well as Leha Lo, Bali Lo, Bali Buah, Bali Kukila, and two rooms in Temple House. 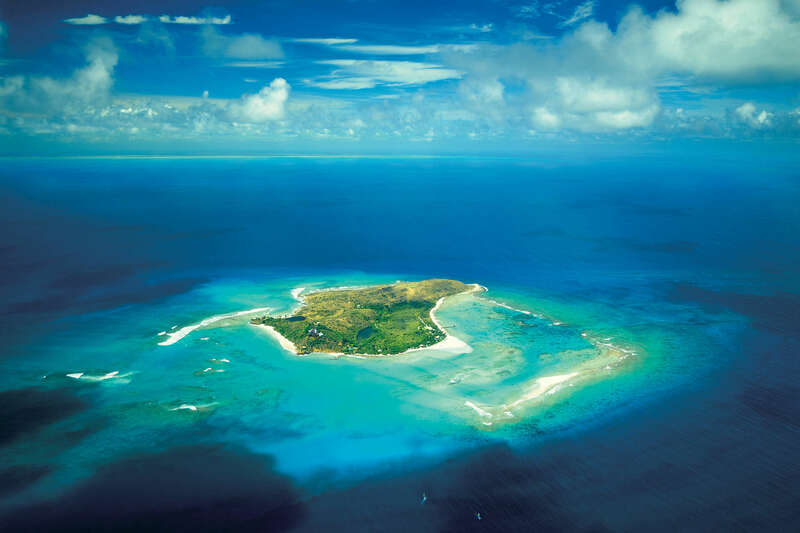 Exclusive hire of Necker Island from 1st April - 15th October 2020 includes the use of 20 bedrooms; made up of 11 in the Great House, inclusive of the Master Suite, as well as Leha Lo, Bali Hi, Bali Beach, Bali Cliff, Bali Lo, Bali Buah and Bali Kukila and two rooms in Temple House. Minimum stays may apply throughout the year. There is a bunk room that can accommodate up to six additional children on Necker Island for a nightly rate of $625 per child. Welcome to Necker Island, Sir Richard Branson’s private island paradise in the British Virgin Islands, a stunning and unspoilt area of the Caribbean. 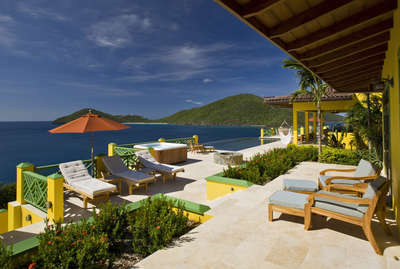 At 74 acres, Necker sits in turquoise waters surrounded by coral reefs and fringed with beautiful white sandy beaches. 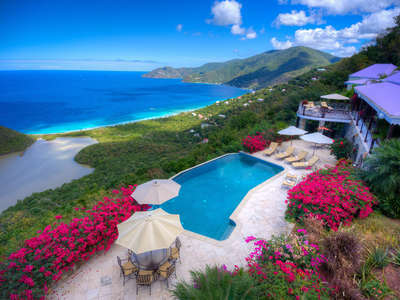 The closest international airport is on Tortola (Beef Island – airport code EIS) which is a 35-minute flight from San Juan and a 1 hour 20 minute flight from Antigua. It is possible to fly to the British Virgin Islands via many parts of the Caribbean, with the most popular routes being via San Juan, Antigua and St. Thomas. By private launch Necker Island is approximately 30 minutes from Tortola and 10 minutes from Virgin Gorda where there is another smaller airport. It is also possible to reach Necker Island by helicopter from Tortola, Virgin Gorda, St. Thomas, San Juan and many other neighbouring islands. Arrival and departure launch transfers to the island are included in the rates. The average monthly temperature in the British Virgin Islands ranges from highs of around 82°F (28°C) in January to highs of roughly 95°F (35°C) in July. In short, it’s hot and sunny pretty much all year round! Regardless of when you plan your visit to Necker Island, you can expect the weather to be warm and pleasant, with the months from September to December generally somewhat wetter than the rest of the year. July is the hottest month, but only by a few degrees.